We lost our beloved Ricky on Friday 21st April, 2006 in our House Fire. We are totally devastated and miss him terribly. 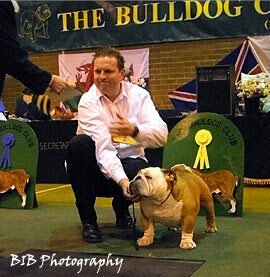 Everybody loved Ricky, he really was a very special Bulldog as they all are. Ricky was coming up for his 6th birthday. He was loved by everyone, he was so good with our children and Foster Children, they pulled him about, dressed him up in girls clothes, painted his toe nails even! He never complained, he just loved and protected them. He did well at the shows and he loved getting in the ring and strutting his stuff. He was a great Dog and had some stud work and has produced some fabulous puppies. We took Ricky for his last walkies to Rainbow Bridge, where he ran off, turned around and gave us a big "High Five" before running over the Bridge! We would like to thank all of you for your kind words of support, cards, messages and calls. We were astounded at the response and this kept us strong so we could keep on supporting Tia and Lola while they were in The Queen Mother Hospital For Animals at The Royal Veterinary College. I was able to resuscitate Tia and after 9 days in Hospital and Lola's 7 days they are now home and both our girls are making a good recovery and are even more spoilt than before! My Sister Dawn. All the boys at Dartford Fire Station. The Vets and Nurses at Mead Road Veterinary Surgery - Dartford. Rob, Karen, Bev and all the ITU Vets and Nurses at the Queen Mother Hospital for Animals in North Mimms. Our Neighbours & friends Sue, Val, Duncan & Ali, Tracy & Roy All at www.Bulldogsuk.com. & Ewa Larsson for updating our web site. We will continue to Support and Raise funds for The Queen Mothers Animal Hospital as they were outstanding and without their ITU unit and staff Tia may not have pulled through. Please leave your personal message in Ricky's Memorial Book.